This Kreature has telekinetic powers, but they aren’t fully developed yet: all it can do is control its trajectory as it bounces along on its rubbery body. However, it is very nimble and can launch itself with surprising force; hard enough to stun an opponent or dent surrounding objects. Its antennae can detect the brainwaves of predators and prey alike from over 50 meters away. Its mind shock ability can give its target temporary amnesia, but it’s less effective the more it’s used; it will unleash a single full-powered blast and then counterattack or escape. The Kooble is one of your “simple but effective” designs. 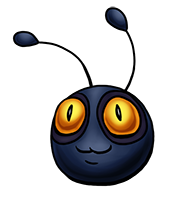 A cute bouncy ball monster with antennae and very expressive eyes I might add.